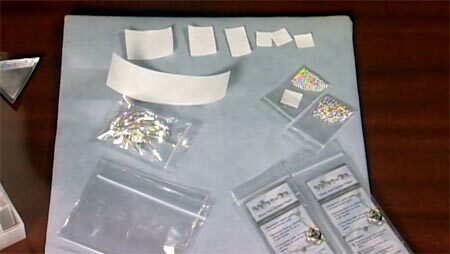 Shine-on Anti-Tarnish paper come in 2-inch by 7-inch strips that are perfect to work in a 1-foot square airtight container. Using a pair of regular scissors, cut an anti-tarnish strip down to appropriate sizes for the airtight container they are to go in. Note: The smaller airtight container you use, the smaller piece of the strip you should use. Place your silver into an airtight container then add an anti-tarnish strip so the printed side is facing down. Note: The strip lasts approximately 6 months.